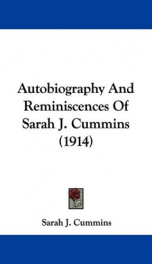 Sarah J. Cummins’ recollections of her overland pioneer journey to Oregon. Sitting alone and glancing over my past life, long and eventful as it has been, I recall many of its scenes of pioneer adventure that were marvelous manifestations of the power and goodness of God in protecting us in our travels through wild regions, inhabited by savages and the haunt of wild beasts. I have decided to write out some important points as they occur to my mind or are copied from my diary as written in years long since gone by, that my children may have printed in book form if they choose to do so. I trust, however, that it will be for no motive greater than to preserve and keep alive the ever present truth of honest ancestry, honorable parentage, a true patriotic sentiment, and simple Christian faith as a rightful heritage in the hearts of all those near and dear.